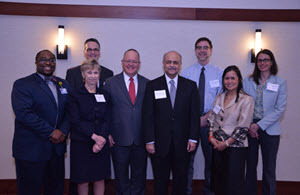 On Friday, March 20th Dr. Paul Phrampus, Director of WISER, and Dr. MacCalus Hogan, Associate Residency Program Director in the Department of Orthopedic Surgery, convened a daylong round-table symposium entitled �Training Tomorrow�s Surgeon at UPMC� at Cumberland Woods Conference Center. The goals of the meeting were to engage in interactive, cross-disciplinary dialog, to discuss the current state of surgical training at UPMC, and to anticipate the needs of the future. The participants included surgeons from various departments and divisions across the health system, researchers, and education leadership. The group discussed the impact of the changes in healthcare, increased focus on patient safety, and quality outcomes and the impacts on surgical training. The day began with opening remarks from Drs. Hogan and Phrampus, a presentation on education by Dr. Barbara Barnes, and a speech about simulation by Dr. Phrampus. The group was fortunate to collaborate with keynote speaker, Dr. Ajit Sachdeva, the founding director of the Division of Education at the American College of Surgeons, who gave a presentation entitled �Training Tomorrow�s Surgeons: Mandates; Challenges; Opportunities.� Breakout sessions followed in which the participants discussed compensation for surgical education, resources available, simulation needs, and system challenges. In the afternoon the participants enjoyed a video presentation, �Learning Science for Better Learning� by keynote speaker Dr. Marsha Lovett, Director of the Eberly Center for Teaching Excellence and Educational Innovation at Carnegie Mellon University. 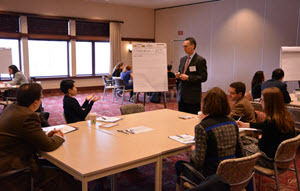 The day ended with additional breakout sessions and a large group discussion of the future of surgical education.